Tony Harrison has been a busy man lately. Being the Provincial Grand Master and the Grand Superintendent of and for the Province of West Lancashire at the same time carries with it a heavy workload and many nights out visiting lodges and chapters. Pictured from left to right, are: Barry Jameson, Tony Harrison, Duncan Smith and Ian Higham. The chance to be at a Provincial Grand Chapter meeting and a chapter installation at the same time can only have been an economy of time management too good to pass up on for our hard-working leader. Cue then, Senatores Chapter of Installed First Principals No 8966 that always concludes its year’s meetings by installing its three principals for the following season. The honoured guest for the installation meeting was (you guessed it) the Grand Superintendent. Tony Harrison who was due to preside over Provincial Grand Lodge a short time afterwards, was faced with a dilemma in that David Randerson, the Assistant to the Provincial Grand Principals in chapter was moving onto Assistant Provincial Grand Master in the Craft. What to do about replacing David in his chapter role? Well, David’s designated successor was Duncan Smith, Group Chairman of North Fylde Group who just happened also to be scribe Ezra in Senatores Chapter. The opportunity to have two meetings in one proved irresistible. The opportunity to witness a one-off occasion like that was always going to be popular and so it proved to be. Over 100 Royal Arch members attended the meeting, filling what is a fairly big meeting room to the rafters. Few had seen such a gathering for a meeting at Cleveleys Masonic Hall and their memories of such were rooted into the mists of time. However, with the scene set and the chapter duly opened, the first main business of the meeting was to ballot for and elect Philip Houldsworth, Gordon McLean, William Derek Williams and Glen Jackson as new members of the chapter. Roger Perry welcomed the new members and Glen Jackson made a suitable reply. Tony Harrison speaking after dinner. The arrival of the Grand Superintendent was announced by Deputy Provincial Grand Director of Ceremonies Neil MacSymons and the entry procession was admitted. Tony Harrison entered, supported by his second and third Provincial Grand Principals, Barry Jameson and Ian Higham, along with the Deputy Grand Superintendent Paul Renton, not to mention five Assistants to the Provincial Grand Principals and many other grand and acting Provincial grand officers. Having welcomed the Grand Superintendent into the chapter, the first principal of Senatores Chapter Roger Perry offered Tony the first principal’s sceptre. This was accepted and Tony Harrison took the chair of the chapter. The other Provincial officers took post and a meeting of Provincial Grand Chapter was opened. After a brief introduction of the principal Provincial grand officers, the Grand Superintendent appointed and invested Duncan Smith as an Assistant to the Provincial Grand Principals. 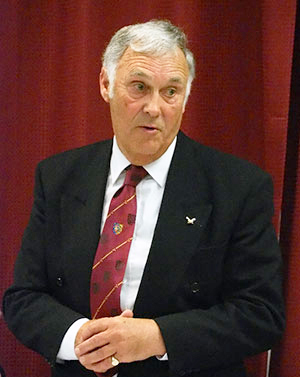 Tony then closed what he described as the shortest Provincial Grand Chapter meeting that he’d ever attended, or presided over and Roger Perry and his co-principals Peter Greathead and Tony Hough were placed back into their respective chairs. Coincidently, Peter Greathead was announced as Duncan Smith’s successor as group chairman, with Tony Hough as his deputy. The other rather important matter, of installing the new principals of Senatores Chapter was then accomplished in fine style with Norman Thomas becoming first principal, Alan Fairhurst as second principal and Provincial Grand Scribe Nehemiah David Barr as third principal. 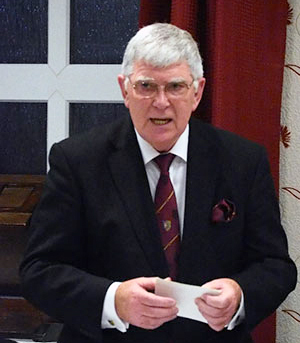 Robe addresses were delivered by Assistant to the Provincial Grand Principals Chris Butterfield, Jonathan Selcoe and Ian Stirling in fine style. At the conclusion of the ceremony a cheque for £300 for the Masonic Charitable Foundation 2021 Festival was presented to the Grand Superintendent by Norman Thomas. Roger Perry proposing the toast to the new principals. In proposing the toast to Tony Harrison, Duncan Smith said that he felt very privileged to be doing so in the company of a ‘who’s who in West Lancashire Royal Arch Masonry.’ Duncan welcomed Tony into Senatores Chapter and offered thanks for Tony’s confidence in appointing him to his new role. Duncan also thanked everyone for all messages of congratulations he had received. He recognised that taking over from David Randerson would be no easy task as David had done a tremendous job during his term. Duncan continued by offering congratulations to the new principals of the chapter, adding that Norman Thomas was a most suitable candidate for first principal after his many years as Provincial Grand Director of Ceremonies. Duncan continued by saying that he was delighted to propose the toast to the Grand Superintendent, who has been in post for 4 years. During this period Tony has been leading by example and was certainly the right man for the job. Duncan also conveyed his admiration for Tony’s wife Maureen for her support at all times. In his response to the toast to his health, Tony said that he had enjoyed a really wonderful evening. He offered sincere thanks to Senatores Chapter for previously electing him an honorary member. He expressed thanks to acting Provincial grand officers who had turned up from all parts of the Province to attend the meeting, particularly his assistants, all but one of whom was in attendance, with one on his holidays. Pictured from left to right, are: Norman Thomas, Neil MacSymons and Dave Barr. The Grand Superintendent also offered thanks to Senatores Chapter for allowing the Provincial Grand Chapter to open in the chapter on the evening. 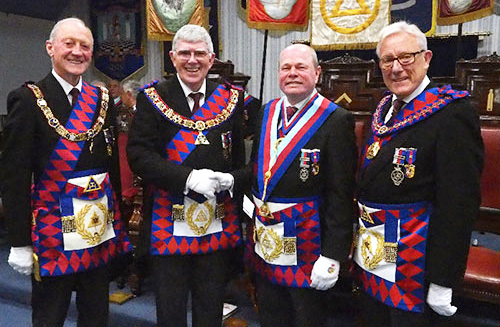 He paid tribute to David Randerson who has worked extremely hard in his role as Assistant to the Provincial Grand Principals to make several improvements in the Royal Arch in West Lancashire. Tony also paid tribute to Harry Cox for all his hard work as an Assistant Provincial Grand Master in his care portfolio and was to be succeeded by David Randerson in May. Tony congratulated Norman Thomas on being installed as first principal of the chapter, at the same time recognising how slickly the ceremony had been performed by Roger Perry and his team. He then went on to offer congratulations to all who had been appointed and promoted in Grand and Provincial Grand Lodge. He urged all brethren of the appropriate age to avail themselves of the PSA testing being repeated at the meeting in Blackpool the following week. Tony continued by urging members to encourage Craft Masons to complete their important journey in their Masonic careers by joining Royal Arch. 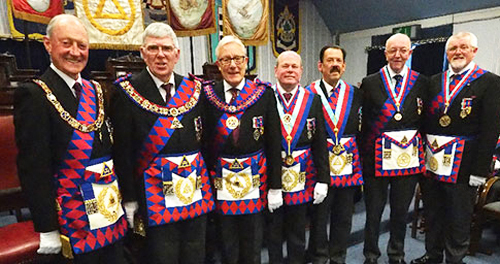 He declared that he wanted everyone to be a membership officer in order to achieve a significant rise in Royal Arch membership. In conclusion Tony went on to mention the Masonic Charitable Foundation 2021 Festival. He thanked everyone for their contributions so far, particularly those who have taken out pledges for patronage. He looked forward to more members joining, as West Lancashire gets back over £1,000,000 in grants for several recipients in this Province. Pictured from left to right, are: Barry Jameson, Tony Harrison, Ian Higham, Duncan Smith, Norman Thomas, Alan Fairhurst and Dave Barr. The next toast was to the health of the new principals of the chapter and was proposed by Roger Perry. Roger declared that the chapter was now in very capable hands. He said that they were leaders who will continue to ensure the prosperity of the chapter, grounding their work on the history and traditions already established by their predecessors. He wished them all an abundance of health to carry out their responsibilities during the ensuing year. In response, Norman Thomas recollected his entry into Royal Arch Masonry, surrounded by many friends and companions. He continued in an amusing and anecdotal manner, talking of many surprises he had experienced along the way. He expressed his deep appreciation for the visit by the Grand Superintendent and the Provincial team and the honour paid to Senatores Chapter by their choice of this occasion to invest Duncan Smith into his new office. 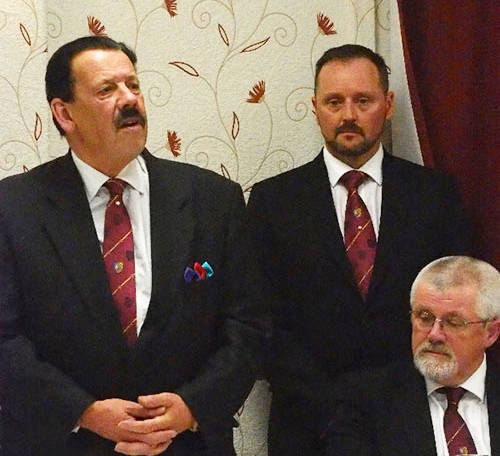 He expressed everyone’s delight at seeing Duncan as the group’s own Assistant to the Provincial Grand Principals. He thanked the members on behalf of all three principals for the honour of being installed into their chairs. He concluded by thanking the previous principals and their installation team for an excellent installation ceremony. The occasion was brought to an appropriate end by the janitor’s toast, which was proposed by Frank Cameron. Pictured from left to right, are: Neil MacSymons, Chris Butterfield, Keith Jackson, Peter Taylor, David Harrison, David Randerson, Colin Rowling, Chris Band, Tony Hall, Dave Barr, Ian Cuerden and David Thomas.